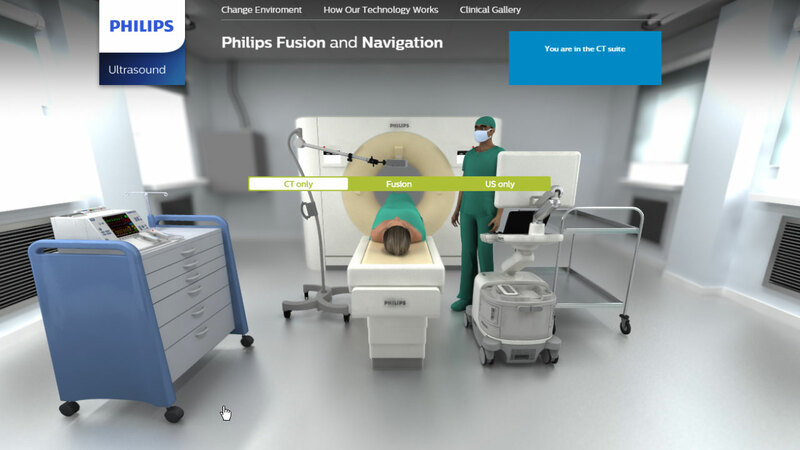 This custom eLearning platform and interactive promotional simulation was custom designed and developed by DDA for Philips Healthcare in 2015. Philips Healthcare, a longtime client of DDA, needed to develop a new Virtual Medical Simulation which would demonstrate different configurations of its new PercuNav interventional suite within different clinical environments. Each of the 3 configurations of the PercuNav interventional suite would need to be combined with 3 different unique clinical environments. DDA was to custom design each of the clinical environments from scratch. Additional resources, including texts, images, and one 2D animation, the latter of which would be developed by DDA's own animators. DDA developed 3 custom clinical environments for the tool: an ultrasound procedure room, a CT suite, and an IR suite. Using client-supplied models of the PercuNav system, DDA rendered 3 different possible configurations of the medical equipment along with a doctor and patient to illustrate the flexibility of the system for various applications. A unique control mechanism allowed for fast and easy changes between configurations within any given clinical environment. DDA also developed special transitions between configurations to add visual appeal. DDA also developed a 75-second animation to explain exactly how the new medical equipment works. Additional text and visual information was associated with specific clickable hot spots on the rendered PercuNav configurations. The final tool demonstrates the exceptional results that can be acheived by combining multiple forms of interactive media to create one cohesive, self-directed eLearning experience that is both engaging and easy to use.